ORCID iD	Institute of Asian Studies, Universiti Brunei Darussalam, Brunei Darussalam. F. Merlin Franco is an ethnobiologist interested in the relationship between indigenous languages, cultures and biological diversity. He is also working with various communities of Asia, to document and revitalize their indigenous calendric systems. 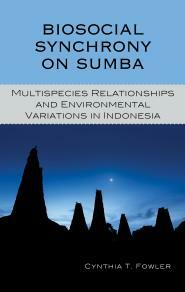 Biosocial Synchrony on Sumba: Multispecies Relationships and Environmental Variations in Indonesia. By Cynthia T. Fowler. 2016. Lexington Books, Lanham. 137 pp. Chakraborty, U. 2014. Effects of Different Phases of the Lunar Month on Humans. Biological Rhythm Research 45:383–396. DOI:10.1080/09291016.2013.830508. Geissmann, T., N. Lwin, S. S. Aung, T. N. Aung, Z. M. Aung, T. H. Hla, M. Grindley, and F. Momberg. 2011. A New Species of Snub-Nosed Monkey, Genus Rhinopithecus Milne-Edwards, 1872 (Primates, Colobinae), from Northern Kachin State, Northeastern Myanmar. American Journal of Primatology 73:96–107. DOI:10.1002/ajp.20894. Gorzelak, M. A., A. K. Asay, B. J. Pickles, and S. W. Simard. 2015. Inter‐plant Communication through Mycorrhizal Networks Mediates Complex Adaptive Behaviour in Plant Communities. AoB Plants 7:plv050. DOI:10.1093/aobpla/plv050. Hoskins, J. 1993. The Play of Time: Kodi Perspectives on Calendars, History, and Exchange. University of California Press, Berkeley, CA. Owens, M., and I. W. McGowan. 2006. Madness and the Moon: The Lunar Cycle and Psychopathology. German Journal of Psychiatry 9:123–127. Proops, L., K. Grounds, A. V. Smith, and K. McComb. 2018. Animals Remember Previous Facial Expressions that Specific Humans Have Exhibited. Current Biology 28:1428–1432. DOI:10.1016/j.cub.2018.03.035. Rydin, C., and K. Bolinder. 2015. Moonlight Pollination in the Gymnosperm Ephedra (Gnetales). Biology Letters 11:20140993. DOI:10.1098/rsbl.2014.0993. Sar, T. K. S., I. Samanta, A. Mahanti, S. Akhtar, and J. R. Dash. 2018. Potential of a Polyherbal Drug to Prevent Antimicrobial Resistance in Bacteria to Antibiotics. Scientific Reports 8:10899. DOI:10.1038/s41598-018-28966-x.